Sen. Richard Lugar’s (R-IN) landslide defeat on Tuesday night adds yet another wrinkle to this year’s battle for the U.S. Senate. Lugar would have been a shoo-in for reelection, but now Democrats have at least a modest chance to grab the seat. Rep. Joe Donnelly, the Democratic nominee, has to be ecstatic. 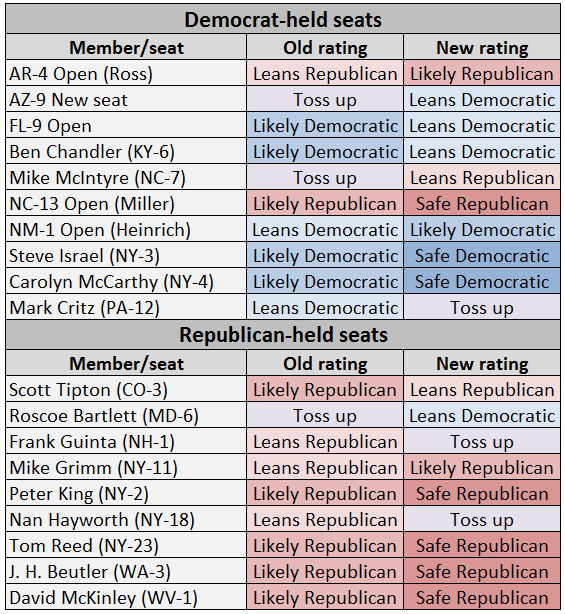 We still believe that Richard Mourdock, the Republican state treasurer who defeated Lugar on Tuesday, is the favorite to win this seat, but we are changing the rating from “likely Republican” to LEANS REPUBLICAN. Lugar ran a miserable campaign and was dogged by questions about his residency — it appeared that he hadn’t lived in the Hoosier State since the 1970s. Lugar’s loss is a lesson that politics, like all other sports, requires practice, and after finding himself in a real race for the first time in decades, Lugar was out of shape. It cost him. Hoosier Republicans wanted a more conservative senator, too — and they might get him. There is one toss-up we’re now comfortable moving: We now favor the Democrats in New Mexico’s Senate race. The reason has little to do with the two likely big party nominees: Rep. Martin Heinrich (D) and ex-Rep. Heather Wilson (R). It does have to do with the fact that New Mexico looks to be squarely in Barack Obama’s camp in November, and we don’t see a huge crossover vote boosting the Republican Wilson. Obviously, if Romney opens up a lead in the presidential race, and if New Mexico becomes competitive, we’ll have to revisit this rating. But, for now, this race LEANS DEMOCRATIC. Finally, and though he had a tougher-than-expected run in 2010, Sen. Joe Manchin (D-WV) is looking strong, in part because his opponent is the lackluster businessman and perennial candidate John Raese, whom Manchin defeated in 2010. We’re moving this race to SAFE DEMOCRATIC, despite West Virginia’s Republican lean at the presidential level. Note that Manchin has declined to endorse his party’s president, Barack Obama, and he did not indicate if he, like so many other West Virginia Democrats, preferred prison inmate Keith Judd to the sitting president.